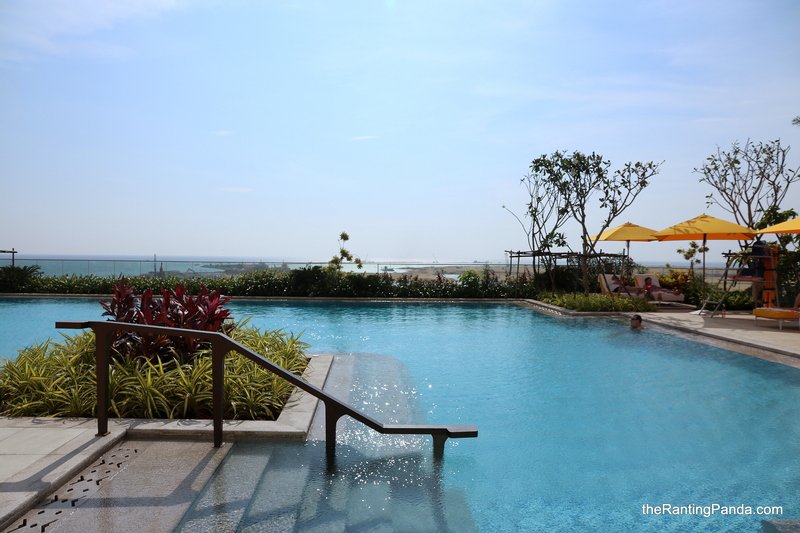 The Place When we visited Colombo, the capital of Sri Lanka, we wanted to go for a familiar luxury brand and were lucky to have stayed at Shangri-La Colombo. The 5-star property opened in November 2017 and was only 4 months old during my stay. With grand and elegant lobby to welcome guests, the hotel is part of One Galle Face development and is located within walking distance to Galle Beach. This is the second Shangri-La property in Sri Lanka after Shangri-La’s Hambantota Golf Resort & Spa located at the south-eastern coast of the island. The Room With a total of about 500 rooms, this is a fairly huge property in Sri Lanka. I stayed in the Deluxe Ocean View Room which boasts views of the hotel’s swimming pool, the Indian Ocean and Galle Face Green. The design of the room is contemporary and elegant, and I especially love the huge bathroom which is luxuriously equipped with Spa Ceylon bath amenities. There is both a walk-in shower and separate bathtub. At 42 sqm, this is definitely a good and comfortable size to sleep in. Wifi access is very important for me, and I am very satisfied with the complimentary high-speed Internet access at the hotel. The Facilities For fitness junkies like myself, there is a well-equipped and huge 24-hours gym, in addition to the swimming pool. On the same level as the gym is also the jacuzzi and steam room facilities. For Golden Circle members, a visit to the Horizon Club at level 32 is a must. This is the highest level of the property and boasts impressive views of the Indian Ocean and Colombo skyline. The Restaurants Table One restaurant is the gorgeous space to have breakfast, with a very good variety of local and International cuisines. In addition, no Shangri-La property is complete without Shang Palace which offers Cantonese cuisine. There are also the likes of Capital Bar & Grill for steaks and seafood, as well as Kaema Sutra, a new-age Sri Lankan restaurant and bar by Celebrity Chef, Dharshan Munidasa, who is also behind the hugely popular Ministry of Crab. Rants It is a stand alone property for now with not much attractions in the close vicinity. That said, there will be a shopping mall linked to the hotel, The Mall at One Galle Face, which is slated to open by the end of 2018. Overall Experience My stay at Shangri-La Colombo is easily one of the best during my trip to Sri Lanka. The property, opened only in November 2017, impresses me with its fine and elegant touches along with the warm service I received from the staff. This is one hotel to splurge on if you are visiting Colombo. For more information, do check out Shangri-La Hotel, Colombo Website.